Ozone (molecular formula O3) is a minor constituent of the Earth's atmosphere, but its effects are highly significant. It is chemically very reactive and is involved in reactions that drive many of the chemical changes that occur in the atmosphere by day and by night. About 90 percent of the ozone in our atmosphere is contained in the stratosphere (part of the upper atmosphere), and about 10 percent is contained in the troposphere (lower atmosphere). Ground-level ozone is an air pollutant with harmful effects on our respiratory system. On the other hand, ozone in the upper atmosphere protects living organisms by preventing damaging ultraviolet light from reaching the Earth's surface. Ozone was discovered in 1840 by Christian Friedrich Schönbein, who named it after the Greek word for smell (ozein), associating it with the peculiar odor in the air after lightning storms. . The odor from a lightning strike, however, is from electrons freed during rapid chemical changes, not from the ozone itself . 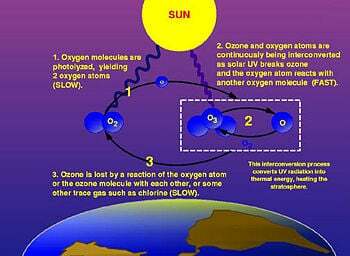 Each molecule of ozone consists of three oxygen atoms, and its molecular formula is therefore written as O3. As such, it is an allotrope of oxygen (dioxygen, O2), which is a much more stable and abundant gas. At standard temperature and pressure (0°C and 100 kilopascals pressure), ozone is a pale blue gas. It forms a dark blue liquid below −112° C and a dark blue solid below −193° C. It is a powerful oxidizing agent (see Reactions below). Ozone is unstable, and when it breaks down, it gives rise to ordinary oxygen (O2) and free radicals of atomic oxygen (O). The reaction is as follows. The free radicals are highly reactive and damage or destroy most organic molecules. They can also combine with each other to produce O2, and they can combine with O2 to produce O3 (in a reverse of the above reaction). In the troposphere, ozone is produced from O2 by many processes, including lightning strikes and combustion. Some types of electrical equipment generate significant levels of ozone. This is especially true of devices using high voltages, such as television sets, laser printers, and photocopiers. Electric motors using brushes can generate ozone from repeated sparking inside the unit. Large motors, such as those used by elevators or hydraulic pumps, will generate more ozone than smaller motors. In addition, ozone is naturally produced by white blood cells and the roots of marigolds as a means of destroying foreign bodies. Much of the ozone in the troposphere is formed when nitrogen oxides (NOx), carbon monoxide (CO), and volatile organic compounds (VOCs; a mixture of hydrocarbons) react in the atmosphere in the presence of sunlight. NOx and VOCs are called ozone precursors. Motor vehicle exhaust, industrial emissions, and chemical solvents are the major anthropogenic sources of these chemicals. Although these precursors often originate in urban areas, winds can carry NOx hundreds of kilometers, causing ozone formation to occur in less populated regions as well. The atmospheric concentration of methane, a VOC, has increased tremendously over the last century, and it contributes to ozone formation on a global scale. Thus, various human activities have raised the concentration of ozone in the troposphere. In addition, about 10 percent of the ozone comes from the stratosphere (which lies just above the troposphere). Hydrocarbons, nitrogen oxides, and ozone are the major components of smog that frequently occurs in urban and suburban areas. Recent satellite maps of nitrogen dioxide (NO2) clearly show the worldwide distribution of polluted regions associated with emissions from automobiles, factories, and power plants that burn fossil fuels. Irritation of the respiratory system, causing coughing, throat irritation, and/or an uncomfortable sensation in the chest. Reduced lung function, making it more difficult to breathe deeply and vigorously. Breathing may become more rapid and more shallow than normal, and a person's ability to engage in vigorous activities may be limited. Aggravation of asthma. When ozone levels are high, more people with asthma have attacks that require a doctor's attention or use of medication. One reason this happens is that ozone makes people more sensitive to allergens, which in turn trigger asthma attacks. Increased susceptibility to respiratory infections. Inflammation and damage to the lining of the lungs. Within a few days, the damaged cells are shed and replaced, much like the skin peels off after a sunburn. Animal studies suggest that if this type of inflammation happens repeatedly over a long time period (months, years, a lifetime), lung tissue may become permanently scarred, resulting in permanent loss of lung function and a lower quality of life. Conversion of cholesterol in the bloodstream to plaque, which causes hardening and narrowing of arteries. A statistical study of 95 large urban communities in the United States found significant association between ozone levels and premature death. The study estimated that a one-third reduction in urban ozone concentrations would save roughly 4,000 lives per year (Bell et. al, 2004). Air quality guidelines, such as those from the World Health Organization (WHO), are based on detailed studies of what levels can cause measurable health effects. There is also evidence of significant reduction in agricultural yields due to increased ground-level ozone, which interferes with photosynthesis and stunts overall growth of some plant species . Although ozone was present at ground level before the industrial revolution, peak concentrations are currently far higher than pre-industrial levels . In addition, background concentrations well away from sources of pollution are substantially higher . Ozone is a powerful oxidizing agent readily reacting with other chemical compounds to make many possibly toxic oxides. In addition, ozone reacts directly with some hydrocarbons (of the type known as alkenes) to produce compounds known as aldehydes and ketones. This process, called ozonolysis, helps lower the amounts of hydrocarbons and ozone in the air, but the products of the ozonolysis are themselves key components of smog. Another reaction of ozone, called photolysis by UV light, leads to production of the hydroxyl radical (OH), which plays a part in the removal of hydrocarbons from the air, but is again a step in the creation of components of smog such as peroxyacyl nitrates, which are powerful eye irritants. Ultimately, ozone is one component of smog that is harmful in itself and contributes to both the production and removal of other air pollutants. Total ozone concentration in June 2000 as measured by EP-TOMS satellite instrument. The ozone layer is the region of the Earth's stratosphere that contains relatively high concentrations of ozone. These concentrations are greatest at altitudes between about 15 and 40 km, where they range from about 2 to 8 parts per million (ppm)—much higher than the ozone concentrations in the troposphere, but still small compared to the atmosphere's main components. The "thickness" of the ozone layer—that is, the total amount of ozone in a column overhead—varies by a large factor worldwide, generally being smaller near the equator and larger as one moves toward the poles. It also varies with season, being in general thicker during the spring and thinner during the autumn. The reasons for this latitude and seasonal dependence are complicated, involving atmospheric circulation patterns as well as solar intensity. The ozone layer was discovered in 1913 by French physicists Charles Fabry and Henri Buisson. Its properties were explored in detail by British meteorologist G. M. B. Dobson, who developed a simple spectrophotometer that could be used to measure stratospheric ozone from the ground. Between 1928 and 1958, Dobson established a worldwide network of ozone monitoring stations that continues to operate today. The standard way to express total ozone amounts in the atmosphere is in terms of the "Dobson unit," which measures the total amount of ozone in a column overhead. When used in industry, ozone is measured in parts per million and percent by mass or weight. The ozone-oxygen cycle in the ozone layer. The photochemical mechanisms that give rise to the ozone layer were worked out by the British physicist Sidney Chapman in 1930. When ultraviolet (UV) light strikes dioxygen molecules (O2), they split up into individual oxygen atoms (atomic oxygen). The atomic oxygen then combines with unbroken O2 to create ozone, O3. Given that the ozone molecule is unstable (although relatively long-lived in the stratosphere), when it is hit by UV light, it splits into a molecule of O2 and an atom of oxygen. These processes, which occur repetitively, are together called the ozone-oxygen cycle and create an ozone layer in the stratosphere. Although the concentration of ozone in the ozone layer is very small, it is vitally important to life because it absorbs biologically harmful UV radiation emitted from the Sun. UV radiation is divided into three categories, based on its wavelength: UV-A, UV-B, and UV-C. UV-C, which would be extremely harmful to humans, is entirely screened out by ozone at around 35 km altitude. UV-B radiation is the main cause of sunburn; excessive exposure can also cause genetic damage, resulting in problems such as skin cancer. The ozone layer is very effective at screening out most of the UV-B; for UV-B radiation with a wavelength of 290 nm, the intensity at the Earth's surface is 350 million times weaker than at the top of the atmosphere. Nevertheless, some UV-B reaches the surface. Most UV-A reaches the surface; this radiation is significantly less harmful, although it can potentially cause genetic damage. Depletion of the ozone layer would allow more of the UV radiation, and particularly the more harmful wavelengths, to reach the surface, causing increased genetic damage to living things. There is much greater probability of DNA damage by UV radiation at various wavelengths. Fortunately, where DNA is easily damaged, such as by wavelengths shorter than 290 nm, ozone strongly absorbs UV. At the longer wavelengths where ozone absorbs weakly, DNA damage is less likely. If there was a 10 percent decrease in ozone, the amount of DNA damaging UV increases, in this case, by about 22 percent. Considering that DNA damage can lead to maladies like skin cancer, it is clear that this absorption of the Sun's UV radiation by ozone is critical for our well-being. Most of the stratospheric ozone is created over the tropics, but then stratospheric wind patterns, known as the "Brewer-Dobson circulation," transport the ozone poleward and downward to the lower stratosphere of the high latitudes. Consequently, most of the ozone is found in the mid-to-high latitudes of the northern and southern hemispheres; the highest levels are found in the spring, not summer, and the lowest in the fall, not winter. Moreover, the ozone layer is higher in altitude in the tropics, and lower in altitude beyond the tropics, especially in the polar regions. Over the continental United States (25° N to 49° N), stratospheric ozone amounts are highest in the spring (April and May). These amounts fall over the course of the summer to their lowest levels in October, then rise again over the course of the winter. Again, wind transport of ozone is principally responsible for the seasonal changes of these higher latitude ozone patterns. The total column amount of ozone generally increases as we move from the tropics to higher latitudes in both hemispheres. However, the overall column amounts are greater in the northern hemisphere high latitudes than in the southern hemisphere high latitudes. The highest amounts of column ozone anywhere in the world are found over the Arctic region during the northern spring period of March and April. The amounts then decrease over the course of the northern summer. Meanwhile, the lowest amounts of column ozone anywhere in the world are found over the Antarctic in the southern spring period of September and October (see "ozone hole" mentioned below). 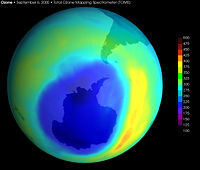 Image of the largest Antarctic ozone hole observed, recorded in September 2000. Data taken by the Total Ozone Mapping Spectrometer (TOMS) instrument aboard NASA's Earth Probe satellite. The term ozone depletion is used to describe two distinct but related observations: (a) a slow, steady decline, of about 3 percent per decade, in the total amount of ozone in the Earth's stratosphere during the past 20 years; and (b) a much larger, but seasonal, decrease in stratospheric ozone over the Earth's polar regions during the same period. The latter phenomenon is commonly referred to as the "ozone hole." The detailed mechanism of formation of polar ozone holes is different from that for the mid-latitude thinning, but both trends are believed to be caused by destruction of ozone by a number of free radical catalysts—particularly hydroxyl (OH), nitric oxide (NO), atomic chlorine (Cl), and atomic bromine (Br). At present, most of the OH and NO in the stratosphere are of natural origin, while the concentrations of Cl and Br atoms (classified as "halogen" atoms) have risen through human activity. It appears that the halogen atoms in the stratosphere are formed mainly by the UV-catalyzed breakdown of chlorofluorocarbon (CFC) compounds, commonly called Freons, and bromofluorocarbon compounds, known as Halons, which are transported into the stratosphere after being emitted at the surface. For this mechanism to operate, there must be a source of O atoms, and these are produced by the breakup of O3 molecules by UV light. A single chlorine atom could keep on destroying ozone for up to two years (the time scale for transport back down to the troposphere), were it not for reactions that remove Cl from this cycle by forming compounds such as hydrochloric acid. On a per-atom basis, bromine is even more efficient than chlorine at destroying ozone, but there is much less bromine in the atmosphere. Given that the ozone layer prevents harmful UVC and UVB wavelengths of light from passing through the Earth's atmosphere, observed and projected decreases in ozone have generated worldwide concern. This concern has led to adoption of the Montreal Protocol, which bans the production of CFCs and halons, as well as related ozone-depleting chemicals such as carbon tetrachloride and 1,1,1-trichloroethane (also known as methyl chloroform). It is suspected that increased UV exposure due to ozone depletion may have a variety of biological consequences, including increases in skin cancer, damage to plants, and reduction of plankton populations in the oceans. Industrially, ozone is produced by subjecting oxygen in the air to either (a) short-wavelength UV radiation using a mercury vapor lamp, or (b) a high-voltage electric field in a process called cold discharge or corona discharge. The cold discharge apparatus consists of two metal plates separated by an air gap and an electrical insulator (such as borosilicate glass or mica). When a high-voltage alternating current is applied to the plates, ozone is formed in the air gap, as O2 molecules dissociate and recombine into O3. In the laboratory, ozone can be produced by electrolysis (electrical breakup) of acidified water. A pencil graphite rod cathode and a platinum wire anode are dipped in a solution containing sulfuric acid (at a concentration of 3 Molar), and the electrodes are connected to a 9-volt battery to generate an electrical current. In the overall reaction, three equivalents of water are converted into one equivalent of ozone and one equivalent of hydrogen. A competing reaction is the formation of oxygen. (See Jorge G. Ibanez et al., 2005, in References below). Ozone is a reagent for many reactions in the laboratory and industry. Some of these are listed here. It is also possible to form compounds called ozonides, which contain the ozonide anion (O3-). These compounds are explosive and must be stored at cryogenic temperatures. Ozonides for all the alkali metals are known. KO3, RbO3, and CsO3 can be prepared from their respective superoxides. For example, KO3 can be formed from KO2. Ozone can be used for bleaching materials and killing bacteria. Many municipal drinking water systems kill bacteria with ozone instead of the more common chlorine. Unlike chlorine, ozone does not form organochlorine compounds (which can be harmful), and ozone does not remain in the water after treatment. Some systems introduce a small amount of chlorine to prevent bacterial growth in the pipes, or may use chlorine intermittently, based on the results of periodic testing. Ozone is also popularly used in spas or hot tubs instead of chlorine or bromine to keep the water free of bacteria. In places where electrical power is abundant, ozone is a cost-effective method of treating water, as it is produced on demand and does not require transportation and storage of hazardous chemicals. Once it has decayed, it leaves no taste or odor in drinking water. to age rubber samples when determining the useful life of a batch of rubber. Ozone has a number of uses in the medical arena. For instance, many hospitals around the world use large ozone generators to decontaminate operating rooms between surgeries. The rooms are cleaned, then sealed airtight and filled with ozone, which effectively kills or neutralizes all remaining bacteria. Ozone can be used to affect the body's antioxidant-prooxidant balance, because the body usually reacts to its presence by producing antioxidant enzymes. Ozone therapy has blossomed into a thriving field of alternative medicine, and there are a host of claimed applications above and beyond what has actually been verified by studies. The U.S. Food and Drug Administration (FDA) has not approved the use of ozone therapy on humans. Nonetheless, at least 12 states (AK, AZ, CO, GA, MN, NY, NC, OH, OK, OR, SC and WA) have passed legislation to ensure that alternative therapies are available to consumers. Physicians in those states can legally use ozone as an alternative treatment in their practice, without fear of prosecution. In addition, medical ozone therapy is recognized in Bulgaria, Cuba, Czech Republic, France, Germany, Israel, Italy, Mexico, Romania, and Russia. At least one death has been attributed to the application of ozone through insufflation in the United States. Nonetheless, "air cleaners" that produce "activated oxygen" (that is, ozone) are often sold. Bell, Michelle L., Aidan McDermott, Scott L. Zeger, Jonathan M. Samet, Francesca Dominici (2004). "Ozone and Short-term Mortality in 95 US Urban Communities, 1987-2000." Journal of the American Medical Association 292: 2372-2378. Ibanez, Jorge G., Rodrigo Mayen-Mondragon, and M. T. Moran-Moran: "Laboratory Experiments on the Electrochemical Remediation of the Environment. Part 7: Microscale Production of Ozone," J. Chem. Ed. 82:10 (October 2005): 1546 Abstract. Horvath, M., L. Bilitzky, & J. Huttner. 1985. "Ozone." Housecroft & Sharpe. 2005. "Inorganic Chemistry." This page was last modified on 8 January 2019, at 21:25.